In 1882 George Carter Stent was assigned to Takow by the Chinese Maritime Customs. By the end of 1884 he was dead and buried in the Takow Foreign Cemetery. Despite his modest beginnings, Stent built a successful career in China, became a Freemason, and made solid literary achievements with several books and dictionaries. Perhaps, above all, George Carter Stent offers a fascinating glimpse into the lifestyle of an Englishman in China and the East in the latter part of the 19th century. George Carter Stent was born in 1833 at 4, North Lane, Holy Cross Westgate, in the Kentish cathedral city of Canterbury, where his father ran a fruiterer's shop and market garden. George had a sister, Julia Ellen, and two brothers James William and Charles Frederic. His photograph on the right was found among the mildewed files at the Foreign Office relating to his death. 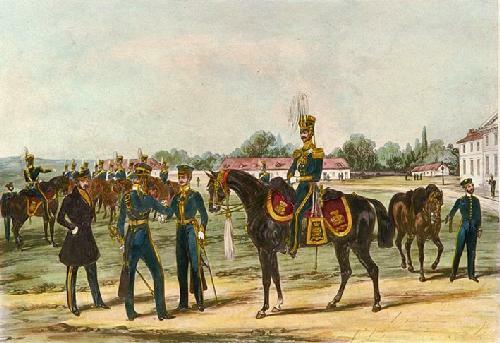 Without the advantages of wealth or higher education and with his elder brother James poised to take over the family business, Stent left home to join the 14th (King's Light) Dragoons as a private around 1855. The 14th Dragoons (see picture below) already had a long and illustrious history. The regiment had originally been raised in 1715, but gained its fame in the Peninsula Campaign, where it served from the outset in 1808 through to the end in 1814. The 14th next came to prominence in the Second Sikh War of 1847-9 in India, where it fought in the battles of Chillianwallah and Goojerat. 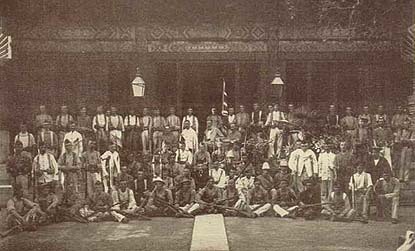 Stent may have enlisted in time to join the 1856-57 Persian Expedition into Afghanistan, but was certainly in India to fight with the 14th throughout the Indian Mutiny of 1857-58. The 14th (King's Light) Dragoons especially distinguished itself during the Indian Mutiny, fighting under Sir Hugh Rose in Central India. Stent received the Indian Mutiny medal, and was later to record his adventures in his Scraps from my sabretasche: Being personal adventures while in the 14th (King's Light) Dragoons which was published by W H Allen & Co (London). (From a photograph by the Rev C A Killie) By the mid 1860s, Stent was in Peking as a member of the British Legation Guard and with the Chinese name of Ssu-teng-de [司登德]. The British, wishing to deal with the Ching Court on an equal footing, found it necessary to appoint a Government Minister to China as an Ambassador was treated as a bearer of tribute. It was thus necessary, both for security and for display, to maintain a sizeable Legation Guard. Stent's ability in studying Chinese, and particularly his aptitude for its colloquial form, attracted the attention and encouragement of the then British Minister (Sir) Thomas Wade. In March 1869, he was recruited into the Chinese Imperial Maritime Customs Service, which was then being extensively reorganized and expanded under its second and most exceptional leader, Sir Robert Hart..
Stent's proficiency in colloquial Chinese was quickly put to use by the Chinese Imperial Maritime Customs (CMC) which published his Chinese and English Vocabulary in the Pekinese Dialect in Shanghai in 1871. This became a very popular desk-book for the would-be speaker of Chinese, or the reader of Chinese light literature, and is seen as his major literary work. During his time with the CMC, Stent seems to have spent much time exploring the Chinese language, particularly through its popular culture. In 1872 he contributed two articles to the Journal of the China Branch of the Royal Asiatic Society of which he was a member (thus MNCBRAS): the first was entitled Chinese Legends; the second, entitled Chinese Lyrics, was later translated into German and published in Leipzig in 1875. In 1874, Stent published his more conveniently-sized Chinese and English Pocket Dictionary. In the same year, W H Allen & Co of London published his first book in England, The Jade Couplet in Twenty-Four Beads. A Collection of Songs, Ballads, &c. This book included translations of some of the old Chinese ballads about the Emperor Ming Huang [明皇] of the T'ang Dynasty. Today, George Carter Stent's name is most associated with a paper that he published in the Journal of the North China Branch of the Royal Asiatic Society in 1877. The article, Chinese Eunuchs, was the first written comprehensive study of the world of the Chinese palace eunuchs and, in particular, the method of castration. Nearly all later studies were based on Stent's work, which is now available as an e-book. In Stent's time there were around 2,000 eunuchs in the Forbidden Palace at Beijing. This number was far fewer than in earlier Ming times, as the Manchu rulers were anyway wary of the eunuchs' power but also since China had been ruled by the Empress Dowager Tzu-hsi [慈禧] on behalf of boy emperors who had little need of concubines. At some stage, presumably in the 1860s, Stent had married his first wife. However, his long absences from England had clearly taken their toll, for in July 1878 he obtained a legal deed of separation from his first wife. The following year he took up with Sarah Ann Page of Prittlewell in Essex, who, at that time was just 21 years old. Also in 1879, Stent wrote a new will at the CMC London Office at 8 Storey's Gate, that was witnessed by H B Morse and F E Taylor. This new will made Sarah Ann Page his sole beneficiary, apart from minor bequests to his two brothers and sister. 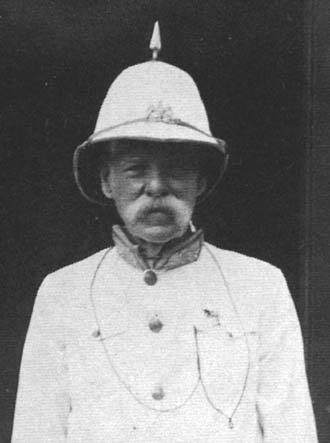 Hosea Ballou Morse was later to become famous, not only as a Chinese Customs Commissioner and historian of China, but also as the man who handed over control of the CMC to the Japanese authorities in 1895. Moreover, chance was to make F E Taylor the Acting Inspector-General in charge of the CMC during the Boxer Rising of 1899-1901. However, little is known about Sarah Ann Page. It is possible that her mother ran a lodging house just behind the Esplanade at then fashionable Southend-on-Sea where Stent struck up a relationship with her, before going together to London where Bertie was subsequently born. In 1880, Sarah Ann gave birth to a boy who was named George Carter Albert Page and known as 'Bertie'. The father was Stent. 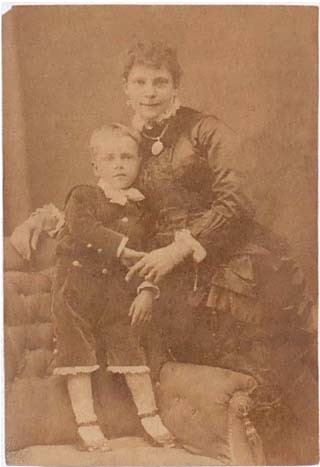 Sarah Ann and Stent's son Bertie are shown in the 1884 photograph on the left which was contained in the last letter that she wrote to Stent. The letter arrived after his death and now languishes, with the photograph, in the Foreign Office files at Kew. During his time with the Chinese Customs rose through the ranks to become Second Assistant, serving over the years in Chefoo (1877), Shanghai, Wenchow and Swatow. 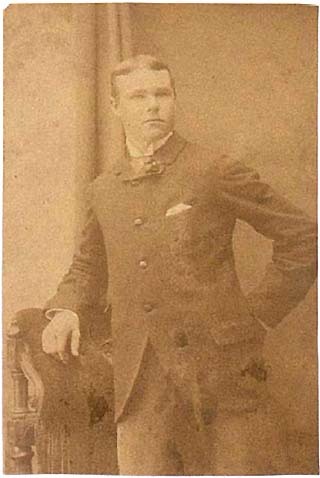 Early in 1882 Stent was appointed to Takow, and in May 1883 he became Assistant-in-Charge. In this capacity Stent was responsible for the erection of the first lighthouse built on Saracen's Head (at Chihou, 旗津). The lighthouse was designed by the Welsh CMC Engineer-in-Chief, John Reginald Harding. The red-brick structure carried a No 6 single-wick light with a range of about 10 nautical miles. 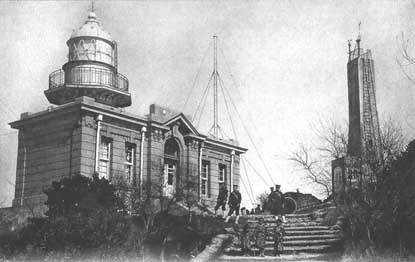 The present structure, built by the Japanese in 1918, is shown in the adjacent photograph with the Stent structure to its right. Dr William Wykeham Myers, who was a medical officer at Takow for many years (c1880-1903), recorded Stent's death in the 1884 CMC Medical Report for Takow, shedding light on both the life Westerners led in the East, and on Stent's hard-working and dedicated character. Dr Myers (shown on the left around 1915 at Pagoda Island) attributed George Carter Stent's death to 'Enthetic disease'. This is most probably a reference to syphilis, known in Chinese as the 'Canton disease', which was one of the steady killers of the foreigners who had spent years in the Far East, Robert Swinhoe being allegedly another victim. The other steady killers were drink and dysentery: indeed, it was said if one did not get you the other would. Myers wrote that Stent 'exhibited but few general symptoms until about 10 days before death ... (although he) complained of subjective sensations of heat, quite out of keeping with actual atmospheric conditions. To relieve this he soaked in cold water during the greater part of the afternoon, and slept naked on his verandah all night. He positively refused to admit that he was ill, and went about his duties as usual'. George Carter Stent died on 1 September 1884 and was buried in a 'lair' at the Foreign Cemetery, Takow. As has been noted above, in 1879 Stent had changed his Will in favour of Sarah Ann Page, who thus inherited his modest residual estate, after bequests to his brothers and sister, of around GBP 400 (around GBP 32,000 at today's values). Fortunately the CMC had purchased an annuity for his first wife, who otherwise would have received nothing. His Will was proven at Her Britannic Majesty's Supreme Court for China and Japan at Shanghai. The Will contained an inventory of Stent's possessions at the time of his death and offer a glimpse at the life of the foreigner stationed in China. At the time of his death, George Carter Stent was engaged on A Dictionary from English to Colloquial Mandarin Chinese; and - strange coincidence (his obituarist narrates) - it was when he had finished the word 'through' that he laid down his pen for the last time. The book was subsequently published posthumously, and is listed, along with Stent's other publications, below. Chinese and English Vocabulary in the Pekinese Dialect; Customs Press, Shanghai, 1871. Chinese Lyrics, Journal of the North China Branch of the Royal Asiatic Society, vol VII,1871. Chinese Legends; Journal of the North China Branch of the Royal Asiatic Society, vol VII, 1872, pp 184-195. Chinese and English Pocket Dictionary; Kelly & Co, Shanghai, 1874. The Jade Chaplet in Twenty-Four Beads. A Collection of Songs, Ballads, &c; W H Allen & Co (London), 1874. Chinesische Gedichte; (German translation of Chinese Lyrics) Adolf Seubert, Leipzig, 1875. Stories from China; London, 1876. Chinese Eunuchs; Journal of the North China Branch of the Royal Asiatic Society, New Series No. 11, 1877, pp 143-184. Entombed Alive and Other Songs, Ballads, &c; W H Allen & Co, London, 1878. Chinesische Eunuchen; (German translation of Chinese Eunuchs), Leipzig, 1879. Scraps from my sabretasche: Being personal adventures while in the 14th (King's Light) Dragoons; W H Allen & Co (London), 1882. A Dictionary from English to Colloquial Mandarin Chinese; Statistical Department of the Inspectorate General of Customs, Shanghai, 1905.